Oh, the bells, the bells….! Natural disasters were not to only thing to bring chaos to the great Benedictine abbey at beautiful Winchcombe in the Gloucestershire Cotswolds. Not just the 1091 lightning strike on the tower of the Abbey church of St Mary, which opened up “a huge crack in the walls, large enough for a man to pass through and destroyed one of the beams: major reconstruction became both inevitable and pressing”. Not even the 1363 “whirlwind [that] damaged the Abbey church”. Indeed not, because humankind created rather large disturbances of its own. “Worse was to follow as the 14th century moved forward. In 1318 the Bishop was called upon to arbitrate in a dispute between the abbot and William de Preston the Vicar. In 1337 Edward III went to war with France and to pay for this he demanded loans from land owners as well as higher taxes. This increased the demands the Abbey made on the townspeople and their tenants. From 1340 – 1388 there are reports of armed men, including chaplains, breaking into the Abbey’s precincts and outlying manors, holding the monks captive and making off with their goods. “Then, to add to all these problems, in 1348/9 the Black Death swept across the country, reducing the population by about one third. Farms and animals were left uncared for, further reducing the income available to both the Abbey and to St Peter’s. By 1351 there are reports of dilapidations, alienation of property and complaints by some monks to the Bishop and Archbishop. Two years later in 1353, the Abbey was, in effect, declared bankrupt and a royal commission appointed to manage it. “John Brightman was succeeded by Thomas Power (1389-1415), who continued the struggle to get the abbot to pay for the maintenance of the chancel. Thomas took his case first to the Bishop of Worcester and lost with costs, then to the Archbishop’s court and lost with further costs. Finally Power appealed to the Papal courts in Rome and lost for the last time. Pope Urban’s ruling in 1389 not only confirmed the decisions of the lower courts but also removed of the vicar’s security of tenure, granting authority to the abbot and the monastic community to appoint and remove vicars at their pleasure (although there is no record that this power was ever used). “Having failed to obtain legal redress, Power, like his predecessor, took the law into his own hands and began ringing the church bells at times designed to disturb the monks’ sleep and their prayers. It was, of course, Henry VIII who had the final say. Sleep in Henry VIII’s bedroom? But not his bed….! The picturesque little Gloucestershire town of Thornbury is not in the Cotswolds, but down in the Vale of the River Severn, between Bristol and Gloucester. Caught between the Cotswold escarpment and the Severn estuary, it is an area of rich farmland, with orchards for cider and perry, and pasture for the production of cheese. Everyone knows about nearby Berkeley Castle, with its grisly tales of red hot pokers, and perhaps a lot of people know there was once a castle at Gloucester, to guard the first bridge over the tidal river. Not so many will know that there is also a Thornbury Castle, or that it is now a luxury hotel. You drive down through Thornbury’s beautiful High Street and into Castle Street, toward the originally Norman church of St Mary at the bottom. And there, behind the church, is the castle and its magnificent grounds. Actually, Thornbury was not always a castle, for it started as a manor house, where Richard II, stayed there on this day, 26th August 1386. There the king met the Cornish writer John Trevisa, who was working on his Polychronicon and the state of the royal prerogative. Richard was to request him to write a history of English kings, from Brutus to his, Richard’s, reign. Henry VII very graciously gave Thornbury to his uncle, Jasper Tudor, whom he elevated to become Duke of Bedford. Jasper died there on 21st December, 1495. In his bed, at the age of 60-something. Not, as Wikipedia would have it, in 1521, beheaded for alleged treason by his “distant cousin” Henry VIII. Henry appropriated Thornbury and spent part of his “honeymoon” there with his new queen, Anne Boleyn. We all know the honeymoon period was soon over! The nobleman who died in 1521 was Edward Stafford, the 3rd Duke of Buckingham, and yes, he was executed for treason. He was the son of Henry Stafford, the second duke, whom Richard III rightly called “the most untrue creature living”. 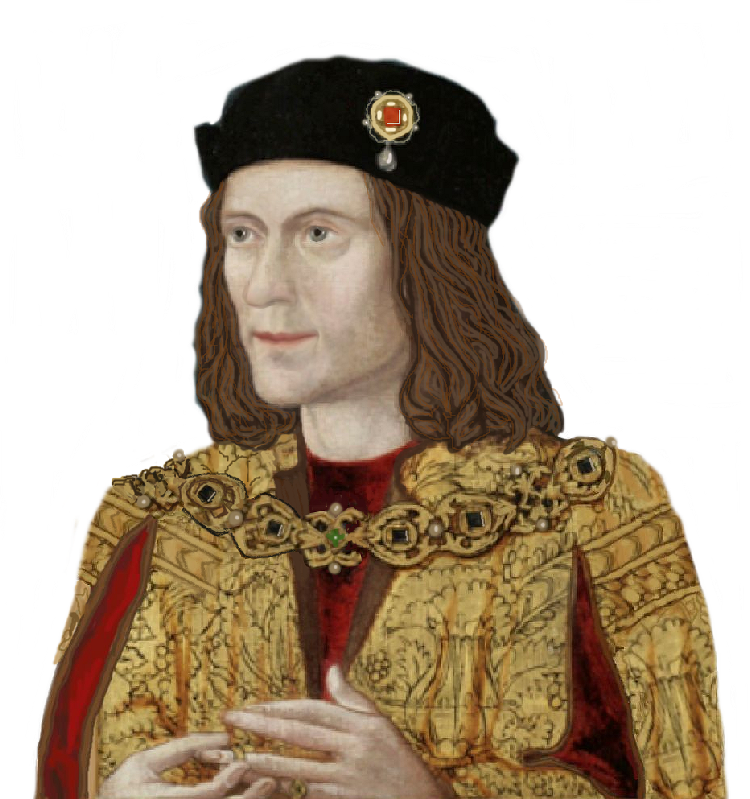 Rebellion against Richard resulted in the second duke’s execution in Salisbury in 1483. So his son hated the House of York, and supported the Tudors. Much good it did him, for they hacked his head off anyway. So you will see that Thornbury has had its share of royal visitors. No doubt there have been more, but I only give a flavour of the history that attaches to this beautiful house. Yes, it is now a castle, having been rebuilt by the above-mentioned Edward Stafford. It was sold in 2017, and so must now be under new management. Oh, and even worse, there is a room called the Duke’s Bedchamber, and it is where Henry VIII supposedly slept. Rather you occupy it, my friends, than me! Here is a link to the hotel’s website. It contains some wonderful aerial views of the castle and grounds. Worth looking at! St Mary’s, Fairford, Gloucestershire. ‘A complete and perfect Perpendicular church’ and famous for it fine collection of medieval glass. Described in Betjeman’s Best British Churches as ‘a complete and perfect Perpendicular’ church(1) this beautiful wool church was rebuilt by John Tame, a wool merchant from Gloucester , in the late 15th Century to replace a much older church. The tower had already been rebuilt by Richard Beauchamp, Earl of Warwick and Lord of the manor around 1430. St Mary’s possesses a complete set of medieval stained glass, amongst the finest in England and it is this glass that I want to focus on now. The glass was made between 1500 and 1517 and, other than the west window, which was severely damaged in a storm in 1703 and later restored, the glass has somehow miraculously survived, although how this has happened remains a mystery. It has been suggested it has survived because of the royal portraits contained in them. The windows are thought to have been a gift from Henry Vll himself. It should be remembered that when Henry had the young Edward Earl of Warwick executed in 1499 he seized his estates which included Fairford. It has also been suggested that Henry may have then given the manor to Prince Arthur whose badge of ostrich feathers and motto appear in some of the windows and one of the portraits is thought to have been modelled up his wife, Katherine of Aragon. Thirty years after Arthur’s death Henry Vlll presented Fairford manor to Katherine of Aragon after he had divested her of her title of queen. The portraits are mostly members of the Tudor royal family and influential people in the Tudor court although one of them is thought to be of a Plantagenet, that of Henry’s brother-in-law, the young Edward of Westminster, one of the ‘princes in the Tower’ Other portraits were modelled on Henry himself, obviously, his wife Elizabeth of York, Catherine of Aragon, Prince Arthur, Henry’s daughters Mary and Margaret and a young Henry Vlll and last but not least Margaret Beaufort (2) I also think its possible that one of them is based on Richard lll, but that is purely my own speculation. Chancel, north chapel, Lady Chapel, North window. Jesus as a small boy in the temple modelled on a young Henry Vlll possibly. Nave, north aisle, west window. Could this figure be Morton? It has been described as Wolsey but I disagree. A wooden boss on the roof of Bere Regis church thought to represent Morton in comparison. Chancel, south chapel, Corpus Christi Chapel, east window. This version of the Virgin Mary is believed to have been modelled on Mary Tudor, Henry Vll’s daughter. See picture below to compare likenesses. A portrait of Mary Tudor to compare to her likeness in the above portrait of her at Fairford. Nave, West Window. The figure with the crown is thought to be that of Henry Vll entering Heaven. Chancel, north chapel, Lady Chapel, north window. The Magus is believed to have been modelled on Prince Arthur. Chancel, north chapel, Lady Chapel, north window. Two royal likenesses here. It it thought that the Virgin Mary was modelled after Catherine of Aragon while that of the attendant with the doves is modelled on Margaret Tudor, Henry Vll’s daughter. Could the lady in red be modelled on Margaret Beaufort? Two kings here..Henry Vl on the left and Henry Vll on the right. Purely my speculation here but could the warrior holding the severed head be a Tudor representation of King Richard lll? For surely one shoulder has been depicted higher than the other one! The monstrous toad of Berkeley Castle…. The toad in question is a well-known story of Berkeley Castle, although I had not heard it before. However, the thought of such a creature being connected to the reign of Henry VII is just too irresistible for the Ricardian in me. So here it is, as taken from Berkeley, A Town in the Marshes, by David Tandy. 1John Smyth of Nibley (1567-1641) The Berkeley Manuscripts: Lives of the Berkeleys. J. Mclean (ed). TBGAS 1883. “Smyth, by talking to many elderly people in his time, had obtained this account. He said he saw a drawing in colour upon the wall of the great hall [of the castle] and on the side of the porch leading into the hall. But this drawing was, as he put it, ‘Washed out or outworne at that time’. “As to the size of this toad, it was said to be in breadth over a foot neere to sixteen inches and in length, more. Having been fed over its life time on flesh and garbage from the butchers, it was said to fill a peck basket, some said a bushel basket. Smyth finished this account with the words ‘But this is all the trueth I knowe, or dare believe’. There is another such carving in the local church of St Mary’s, see below. There is more about this monstrous toad here. Shepperdine, a hamlet on the shore of the Severn Estuary…. Shepperdine is a tiny settlement on the east shore of the Severn Estuary, SW of Berkeley, NW of Thornbury, and was once under the rule of the Berkeleys of Berkeley Castle, who hunted the now lost Horwood Forest that covered the area all the way to Bristol. This little part of England has not changed in centuries, but will soon be loomed over by a new nuclear power station, which will dominate everything and banish the past. So I am writing something about Shepperdine as I’ve known about it. Shepperdine is generally referred to along with the manor of Hill, which is very close by. Hill was included in a grant of the Barony of Berkeley, bestowed upon Robert Fitzharding by Henry II after his accession in 1154. The manor stayed in the Berkeley family until coming into the possession of Robert Poyntz of nearby Iron Acton in 1418, whose family held it until 1609. I do not know much more of its history, except that the present manor house is a 19th-century building that replaced an earlier one. It is said that Joseph of Arimathea didn’t only come to Glastonbury to strike his staff into the ground so that a holy thorn tree grew. No, indeed. Gloucestershire claims he visited Shepperdine too, and struck the ground with his staff again so that a second holy thorn grew, and, like Glastonbury, supposedly bloomed at Christmas. Unlikely? Well, no more so than Glastonbury’s claim, because Shepperdine is only a short voyage up the coast. I must come clean here, and admit that the story is probably the invention of a solitary priest in a nearby medieval chapel (now known as Chapel House) to boost income and alleviate his boredom. Part of the flat, marshy, dyke-crossed land between Hill and the estuary is known as the World’s End, and appropriately so. There, right beneath the sea wall, is Shepperdine, lonely, isolated, atmospheric and thought-provoking. It has also been known as Shepherdine and Shipperdine, and takes its name from the Danish vessels that beached here in Anglo-Saxon times, safe between the Severn and Horwood Forest. Berkeley Vale has always been an area of farms, fields, orchards, sleepy villages and little winding back roads. It is famous for cider, perry, Single and Double Gloucester cheese, and all the other produce that comes from the rich land that lies in the lee of the sea defence. Stand on the levee with your back to the vale, and there is the wild, dangerously tidal Severn estuary, beyond which rise the hills of Wales and the Forest of Dean. From the Severn comes the wonderful harvest of the sea, salmon, eels and elvers, and all manner of other sea life. The vale has always had everything it needs, and had no need to change, which is why it is as unspoilt now as it always has been. As a matter of interest, Horwood Forest was disafforested in 1228, and to be certain of what this meant, I looked it up. Disafforest means to “reduce from the privileges of a forest to the state of ordinary land : exempt from the forest laws”. A walk along the sea wall (on top of which passes the Severn Way footpath) is to breathe more freely and clear the cobwebs that we all accumulate in our heads. But I feel sorry for that priest on his own in the chapel, because to have such bracing, stimulating air day-in, day-out would be a little overwhelming, especially on a bleak winter’s day, with the incoming tide roaring and the wind howling. Too much fresh air already! Or whatever he would have muttered in mediaeval Latin! To himself, because there was no one there to listen. For centuries the only way of getting along this coast was by water, or on foot or horse. And sometimes there was no getting along there at all because of floods. Shepperdine would have been engulfed in the Great Flood of 1607 (which is now suggested to have been a tsunami). The Windbound Inn (closed in 2004 and now about to be/already is demolished) was only 7 metres above sea level, and nestled behind the levee that did not always protect it. The higher Severn tides can pour over the access to the Severn Way along the top of the levee. I read somewhere that water once poured down the inn’s chimneys to flood the place to a depth of four feet! What you see in the picture below is a modern first-floor gable extension, the original inn building is lower. The picture also shows how the inn huddles in the lee of the sea wall. In high tides, the water laps within feet of the building. In the distance in the photograph below you can see the old Severn suspension bridge, and a glimmer of the new crossing beyond it. Here’s a fascinating anecdote of Shepperdine from 18th September 1954 or 55. Lord Noel Buxtun walked right across the estuary, guided by a local man’s knowledge. The lowest point of the river is between Aylburton and Shepperdine, and is an old Roman ford. A zig-zag course was worked out for Lord Noel to follow. At the deepest point the river came up to his chest, but he made it to the other side. Rather him than me! Be stuck in the middle of a two-mile wide River Severn, right up to the chest? And stay sane enough to keep walking? To say nothing of trying to remember whether you were on the zig or the zag. Of course, you’d need to be lacking in sanity to make such a crossing in the first place. The Beachley-Aust ferry wasn’t far away to the south, and to the north you could drive around via Gloucester. Much more sensible. But then, I believe his lordship also crossed the Humber like this. And the Thames, which he miscalculated and had to swim part of the way. Say no more, really. The following passage is taken from Severn Tide by Brian Waters, who also wrote Severn Stream, about the inland reaches of the river. “The building [the mediaeval chapel] is now known as Chapel Cottages, and stands as a buttress of the sea wall where the land bends into the river, and where the main channel of the Severn curves toward the chapel. Navigational lights stand on the shore beside the building and they remind us that Thomas, Lord Berkeley, who founded the chapel in the fourteenth century, was a practical man. He gave ‘competent lands’ to maintain a priest to sing there, and under his heirs the house became a chantry until the Reformation. It stands exactly opposite the monastic chapel of Woolaston across the river. The chapel served the secular purpose of being a guide to shipping and a landmark to sailors. What the original chapel looked like I cannot say, except that it would have been simple. Being got-at over the centuries has not improved its appearance! It was derelict again when I walked there with my husband and daughter when she was a child, but is now a house again. We liked to go to the Windbound Inn and then stroll north along the embankment toward the chapel. Now the Windbound is no more, and soon there will be a new nuclear power station to tower over this amazing coastline. This will be to replace nearby Oldbury, which has been decommissioned. When Shakespeare was in Gloucestershire…. When happening upon this BBC page, I was reminded of an old friend. I worked with her yonks ago and we have remained friends, if sporadically. Her maiden name was Shakespeare, and she said her family was descended from THE Shakespeares. Now, she is an intelligent woman, and would not have said that unless she was sure of her facts. She and her family are to be found in Gloucestershire, specifically in the Gloucester-Stonehouse-Stroud-Dursley area, which is more or less my area too, albeit by adoption. Maybe the Bard himself was active in more ways than one when he came to the county? Who knows. But there are still Shakespeares around in this neck of the woods!